R.C.N. Court & Inn is located in a small local community, but in the heart of town in old city area. Tha Phae Gate and Sunday Walking Street just 10 minutes away by slowly steps. It is closed to important Buddhism temple Wat Chiang Man, the first Buddhist temple in Chiang Mai, and Sompet Market, which is fresh market at day time and become night street foods at night time. Offering cozy and clean beds, R.C.N. 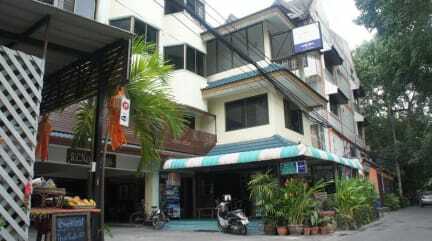 is a warm and friendly guesthouse that welcomes the travlers all over the world. After check in, guests can take advantage of on-site facilities, such as spacious shared living room and huge communal kitchen. Featuring hot water, the rooms are about 24 sqm. 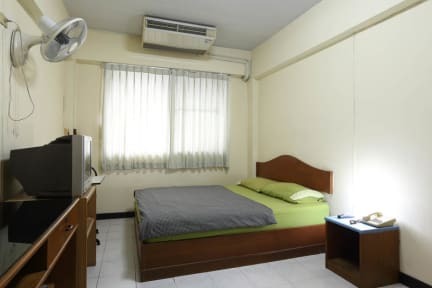 size, consisting of queen size bed, TV with international cable, airconditioner or fan. There is temple view and city view with big window. Free Wi-Fi access is available in whole area to keep you connected. Conveniences include laundry service and washing machine, tour and trek service and information and free luggage storage and safe box. For meals, R.C.N. has a in-house restaurant with local and international foods. 2. Both cash and credit card (Visa, Mastercard, UnionPay) are accepted upon arrival. 5% is applied for bank surcharge when using credit card. 3. Cancellation policy: At least a 3-day advance notice prior to the arrival date is reuqired for cancellation free of charge.